As promised, I got the chance to see my buddy with the cam. The picture posted is taken with one day of growth (I shaved bald yeserday) and in broad daylight with a flash. The camera used is a 2 year old Canon Powershot Pro. You can clearly see the new/rejuvenated follicles but like I say, I can’t really use the resulting hair in any cosmetic fashion yet. The entire top of the scalp and fron was bald prior to the experiment. No sign of life. What I’ve got ain’t much but it’s proof of concept. I will try to post a pic with a week’s growth before I wax for my next experiment. Apparently waxing could give me an 11 fold increase in follicles over non-depilation. The pic shows results with non-depilation. Take it or leave it, I couldn’t give a toss. I’ve been fighting for 27 years and I deserve to finally get my hair back. I hope that I do. P.S. Sorry about the white skin. I normally slap some tan on but I didn’t want to compromise the pic. Also, for some reason it wouldn’t accept the jpg file from the cam so I had to convert it to jpg with some demo software, hence the ‘image Converter watermark’. Great pic and I take your word that you are seeing regrowth, but we really need to see a clear before pic to compare. PRETTY IMAGE…AS I THOUGHT, BACCY, BENJI, CAL…AMONG OTHERS, GOOD WORK;-) I BELIEVE THAT WE WILL HAVE EXCELLENT RESULTS THROUGH YOUR STUDIES, WELL BEFORE FOLLICA. Cool picture Baccy. I hope the depilation will help. the new follicles do they grow single or even multiple hair each? » need to see a clear before pic to compare. If you really DO take my word, the word is, I was totally bald. Nothing there. Now I have something but nothing useable yet. It’s proof of concept. I don’t have any before pics as I’ve previously explained. My whole experiment was somewhat disorganised but maybe this pic will serve as a ‘before’ pic for my upcoming experiment in mid to late SEptember. It’s enough to convince me that a full head of hair is possible with this procedure. If I can get results with my tinpot procedure, who knows what Cotsarelis will achieve? » Cool picture Baccy. I hope the depilation will help. » the new follicles do they grow single or even multiple hair each? I’m unsure what you mean. Each follicle grows one hair. But the frustrating thing is that you can only see these follicles close up. They don’t constitute a hair shadow yet. But some of the hairs look pretty damned healthy when I’ve let them grow for a week. another observation … you grew more on top then on the sides. looks like the topicals got better through the skin on top of your head? or maybe on the sides they run down? » » Cool picture Baccy. I hope the depilation will help. » » the new follicles do they grow single or even multiple hair each? » damned healthy when I’ve let them grow for a week. normally follicles make groups. so each follicular unit is 1-4 hairs each or even more. » another observation … you grew more on top then on the sides. » looks like the topicals got better through the skin on top of your head? » or maybe on the sides they run down? I put that down to the rug I wore for 12 years. It was glued at the sides. BTW if you want proper depilation, try waxing it. chemical depilations may work differently, waxing would make sure the hair is gone from the follicle completely. » » » Cool picture Baccy. I hope the depilation will help. » » » the new follicles do they grow single or even multiple hair each? » » frustrating thing is that you can only see these follicles close up. » » damned healthy when I’ve let them grow for a week. I’ll have to check that. If that’s the case, the one’s that only have one hair may be coaxed into producing more. I’ve got some Veet wax strips. I’ll grow the hair to about 3mm before waxing. Can you post exactly what you did? Hi Baccy, i’ve been reading these forums for a while now and have made a few posts on the “Follica! - good news forum”. I remember a while ago you mentioned problems relating to finding a source for lithium chloride in the UK. I’ve bought some myself recently and am happy with the product, the wesite is as follows, great success by the way and good luck with your further experiments. » of the scalp and fron was bald prior to the experiment. No sign of life. » waxing could give me an 11 fold increase in follicles over non-depilation. 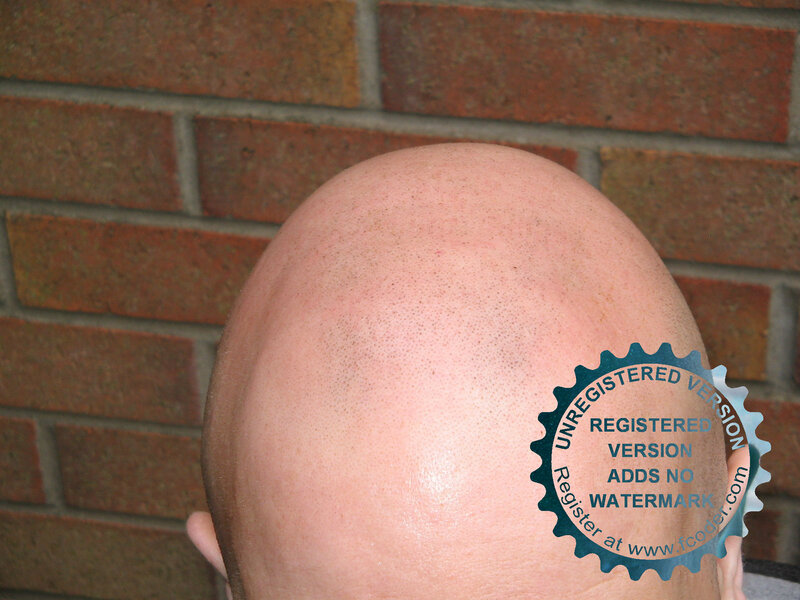 » The pic shows results with non-depilation. » years and I deserve to finally get my hair back. I hope that I do. » want to compromise the pic. Very impressive pictures Baccy. I would like to see them grown out a little more. It looks like you’ve achieved quite a bit of regrowth. Looks VERY promising! Best of luck on continued attempts. Please keep us posted. » few posts on the “Follica! - good news forum”. » and good luck with your further experiments. Cheers for that m8. But I think lithium orotate is doing the job fine. Are you experimenting yourself? » Can you post exactly what you did? I’ll try. It wasn’t very scientific with the measures etc. I sanded my head quite heavily but wasn’t really satified with the damage. So I put 30% glycolic acid peel on top of the sanded skin and left on for 5 minutes. I left the skin to epithelize for 3 days and then applied quercetin, lithium, caffeine and dmso in a alpha lipoic acid cream. I applied that all over the scalp twice daily. After a couple of days of this I found information on the internet that stated that quercetin inhibited wnt signaling AS WELL AS EGF. Well as you know, we need wnt UPREGULATING so I class the first couple of days as an error. I then transferred to milk-thistle extract as the EGF inhibitor and ditched the quercetin. I made a fresh topical mixed into emu oil. After applying the topical for about 11 days (Day 14 post wounding) I stopped the EGF inhibition topical and transferred to minox with caffeine and lithium dissolved in dmso mixed into the bottle of minox. I also began to use copper peptides. Most recently, I’m using benadryl cream once or twice a day too. Not very scientific I’m afraid and I can’t even remember how many capsules of each substance I used as it was all guesses. I don’t think the amount is THAT important. Search back to July posts and you’ll find a lot of info on what I did as I was doing it. The next experiment, I will depilate first and then wait 3 days. Whilst waiting, I will begin EGF inhibition with tannic acid so EGF is inhibited DURING epithelization. I still plan on using lithium orotate and caffeine with dmso and emu oil. Tannic acid amount has to be kept low (around 1%) as pure tannic acid is toxic to the liver. Therefore, the amount of dmso must be kept low too so as not to get too much absorption. The next experiment will probably be about 17th or 18th Sept as I’m waiting for the tannic acid. The company messed up my order once and so it’s been delayed. Have you got some good results from that product moomin? » I’ll try. It wasn’t very scientific with the measures etc. » I sanded my head quite heavily but wasn’t really satified with the damage. » quercetin, lithium, caffeine and dmso in a alpha lipoic acid cream. THANKS MAN! I wish you had picture of what the sanded scalp look like so that I have an idea how deep you go with the dermabrasion. Did it hurt for a few days ? Good luck Baccy - Keep it up!